I’ll write about a different kind of topic today. “Citizen science” is a relatively new term though the activity itself is not so new. One definition of citizen science is “the systematic collection and analysis of data; development of technology; testing of natural phenomena; and the dissemination of these activities by researchers on a primarily avocational basis.” It involves public participation and engagement in scientific research in a way that educates the participants, makes the research more democratic, and makes it possible to perform tasks that a small number of researchers could not accomplish alone. Volunteers simply need access to a computer (or smartphone) and an internet connection to become involved and assist scientific research. 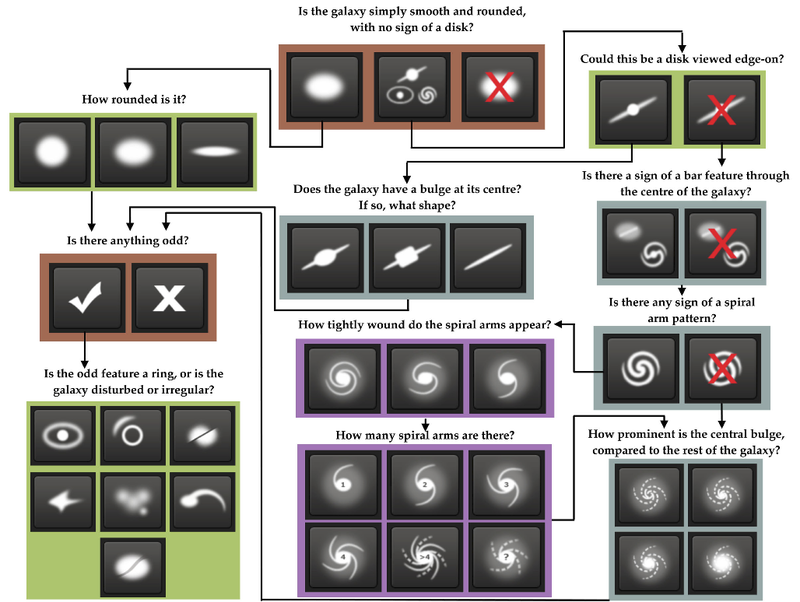 Citizen science was popularized a few years ago by Galaxy Zoo, which involved visually classifying hundreds of thousands of galaxies into spirals, ellipticals, mergers, and finer classifications using the classification tree below. (I am a member of the Galaxy Zoo collaboration and have published a few papers with them.) 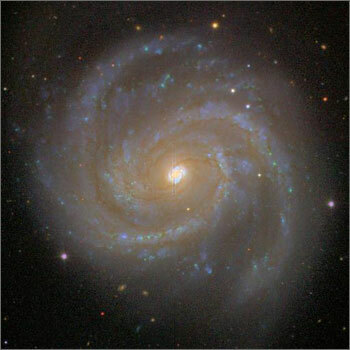 As a result of “crowdsourcing” the work of more than 100,000 volunteers around the world, new scientific research can be done that was not previously possible with such large datasets, including studies of the handedness of spiral galaxies, analyses of the environmental dependence of barred galaxies, and the identification of rare objects such as a quasar light echo that was dubbed “Hanny’s Voorwerp”. Other citizen science projects include mapping the moon, mapping air pollution, counting birds with birdwatchers, classifying a variety of insects, and many other projects. Citizen scientists have many motivations, but it appears that the primary one is the desire to make a contribution to scientific research (see this paper). In the process, by bringing together professional scientists and members of the general public and facilitating interactions between them, citizen science projects are important for outreach purposes, not just for research. In addition, by encouraging people to see a variety of images or photographs and to learn about how the research is done, citizen science is useful for education as well. Many valuable educational tools have been produced (such as by the Zooniverse projects). Citizen science projects are popular and proliferating because they give the opportunity for people at home or in the classroom to become actively involved in science. It has other advantages too, including raising awareness and stimulating interest in particular issues. Citizen science is continuing to evolve, and in the era of “big data” and social media, it has much potential and room for improvement. As a new teacher one of my many goals is to introduce my students to different projects in citizen science. In terms of educating scientifically literate citizens and creating access to city kids, I can’t think of a better way. Take chances, make mistakes, get messy! That’s great! I totally agree. Good luck introducing your students to citizen science, and I’m interested to hear how it goes. Thanks for the support! So far, so good. I love it.